The new ship’s main area of responsibility will be the disputed Paracel Islands in the South China Sea. The People’s Liberation Army Navy (PLAN) has commissioned a new Type 056A Jiangdao-class corvette at Yulin naval base in the port city of Sanya on Hainan Island on June 8, China Military Online reports. 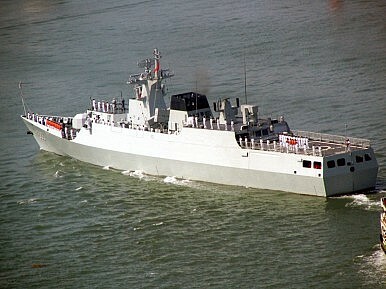 The new Jiangdao-class corvette Qujing (pennant number 508) will join the PLAN’s South Sea Fleet and is expected to be deployed to the disputed Paracel Islands, according to Chinese military sources. “The Type 056A frigate Qujing, with a full displacement of over 1,300 tons, is developed and built by China independently. It has a good stealth performance and is capable of attacking aircrafts, surface ships and submarines independently or in coordination with other naval forces,” China Military Online states. The Jiangdao-class corvette will likely be assigned to the 26th light frigate squadron operating out of Yangpu naval base near the Gulf of Tonkin, IHS Jane’s Defense Weekly reports. The squadron already operates two other Type 056 Jiangdao-class corvettes. Given its Type 056A (rather than Type 056) designation, the Qujing appears to be an anti-submarine warfare variant of the ship class featuring enhanced ASW capabilities. Next to four YJ-83 anti-ship missiles (two launchers with two missiles each) and a 76-millimeter main gun, the ASW variant is also equipped with two 324 millimeter triple torpedo launchers, as well as variable depth and towed sonars. The ship’s flight deck also allows operation of a Harbin Z-9 military helicopter, specifically equipped for ASW missions. The Qujing is the 26th Type 056A Jiangdao-class corvette to enter service with the PLAN, and the 10th Type 056A ship assigned to the South Sea Fleet. Overall, the PLAN plans to add an additional five corvettes—designate light missile frigates by the PLAN—in 2016 to replace older vessels. “The Type 056 corvettes are believed to be replacing patrol boats of the Type 037 class, and it was reported in May that a further three of these (pennant numbers 746, 748 and 786) have been withdrawn from service,” according to IHS Jane’s Defense Weekly. Type 054A Jiangkai II-class frigates are multirole warships and have been deployed for anti-piracy operations in the Gulf of Aden since 2009, and also participated in Sino-Russian maritime exercises in 2015. There are currently 20 Type 054A Jiangkai II-class frigates in service with the PLAN (with five under construction). The China Coast Guard (CCG) has apparently also been converting Type 054A ships into CCG white-hull cutters (See: “Is China’s Coast Guard About to Field a Modified PLA Warship?”). China is launching one new corvette every six weeks.